a heart surrendered: Dennis teaches our boys about Perspective. Dennis teaches our boys about Perspective. 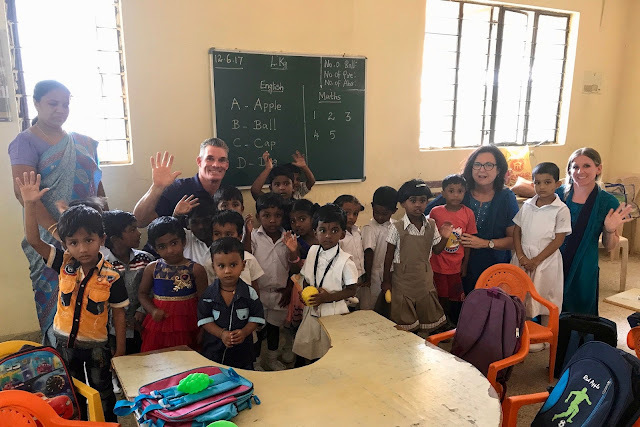 Dennis has been in India for the past week training teachers. Every day he sends an update via e-mail, and every day he sends a letter to our sons. Today's letter was titled: Every now and then perspective shows up. I share it here because - it matters. When I was a kid car rides were not something my sister or myself looked forward to taking. Age 4 - Drove from California to Florida in the backseat of a sedan. Age 8 - Went to Hawaii and saw every fern, flower, and volcanic rock on the island...from a car window! Age 13 - Drove to Lake Powell in the back of a station wagon listening to two tapes, The Carpenters, and George Benson. As you can see, sometimes you have to do uncomfortable things in order to get to the destination you desire. Over the past three days, we have had the privilege to teach teachers who come from a variety of cities and regions in India. Three men, in particular, come from West Bengal, India. West Bengal is located up north near Nepal. Chennai (where I am) is in the south. No problem, except they traveled by train! Pull out your scorecards sports fans! They traveled all that way in discomfort to learn how to better serve preschool children in their school. On Saturday they will begin their 40-hour journey back home. Throughout this current trip I have been reminiscent of Philippians 2:14, "Do everything without grumbling and complaining." This is an area in which I desire to grow. We accomplish very little when we complain and are looking for a way out rather than a way through the experience. Who wants to ride three to a seat on a hot train with hundreds of people for the equivalent of two weeks worth of work? Three men from West Bengal who want to make a difference in the lives of children in the school in which they teach. Find a way to make a difference today. Dennis writes to his sons. Not easy - but worth it! A lesson learned late - but never forgotten!